Is planning for America anathema to the pursuit of life, liberty and happiness? Is it true, as ideologues like Friedrich Von Hayek, Milton Friedman, and Ayn Rand have claimed, that planning leads to dictatorship, that the state is wholly destructive, and that prosperity is owed entirely to the workings of a free market? 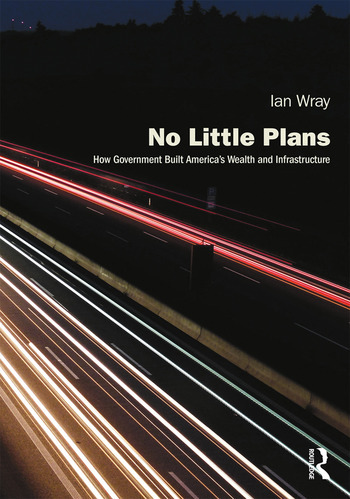 To answer these questions Ian Wray’s book goes in search of an America shaped by government, plans and bureaucrats, not by businesses, bankers and shareholders. He demonstrates that government plans did not damage American wealth. On the contrary, they built it, and in the most profound ways. In three parts, the book is an intellectual roller coaster. Part I takes the reader downhill, examining the rise and fall of rational planning, and looks at the converging bands of planning critics, led on the right by the Chicago School of Economics, on the left by the rise of conservation and the ‘counterculture’, and two brilliantly iconoclastic writers – Jane Jacobs and Rachel Carson. In Part II, eight case studies take us from the trans-continental railroads through the national parks, the Federal dams and hydropower schemes, the wartime arsenal of democracy, to the postwar interstate highways, planning for New York, the moon shot and the creation of the internet. These are stories of immense government achievement. Part III looks at what might lie ahead, reflecting on a huge irony: the ideology which underpins the economic and political rise of Asia (by which America now feels so threatened) echoes the pragmatic plans and actions which once secured America’s rise to globalism. Ian Wray is Visiting Professor in Civic Design and Heseltine Institute Fellow at the University of Liverpool. He is a Fellow of the Academy of Social Sciences and Vice Chair of World Heritage UK. He was Chief Planner, Northwest Development Agency, 2000–2010. He has written for the Architects Journal and Management Today and is the author of Great British Plans: Who Made Them and How They Worked.